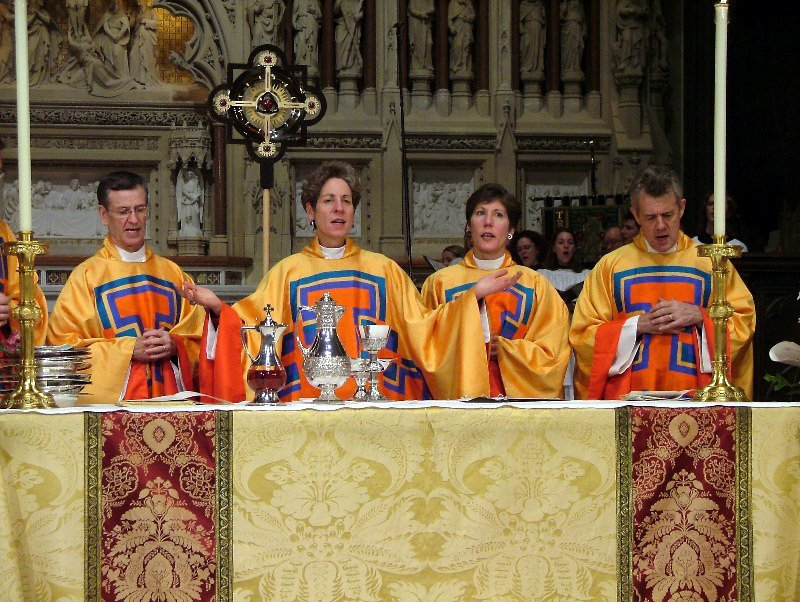 From Preachers Institute: A convert to Orthodoxy from the Episcopal Church, Ms. Linsley renounced her priestly office in March 2004. 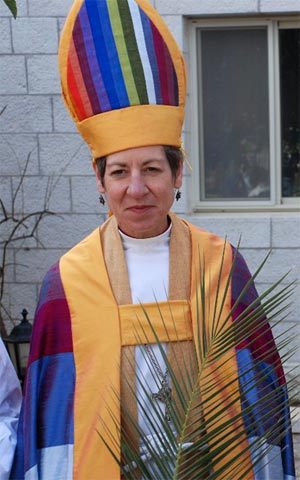 She left the Episcopal ministry on the Sunday that Gene Robinson was consecrated and has not entered an Episcopal church since. After years of studying the question of women priests she is persuaded that this innovation is the root cause of the schism within Anglicanism. She is also the author of the excellent blog: Just Genesis. In this essay we have discussed the origins and nature of the priesthood. Holy Tradition and Scripture reveal numerous women in positions of leadership; Deborah and Huldah among them. Daughters of priests are remembered as great women also, Asenath and Zipporah among them. However not a single women can be identified as a priest in Holy Tradition or the Bible. It is clear then that women have never been priests and that the nature of the priesthood from the beginning has been such that it pertains only to men. So called “priestesses” of ancient Greece were not priests at all. They were seers who pronounced oracles in a trace state, like shamans. Likewise, Shinto “priests” are also shamans as they deal with the spirits. Use of the term “priest” in both cases reveals ignorance about the different worldviews of priests and shamans , an ignorance (or bias?) that pervades 20th century academia. Years ago, I too was an Episcopalian but women Priestesses never sat well with me. When asked, my answer was always “when I meet a woman who has gone into the Priesthood for the right reasons, then maybe I would support it”. By that, I meant that every woman Priestess I met was always about womens rights, abortion rights, not having to bring casseroles to the Sunday potluck anymore ( and yes, I did hear that as a reason and yes, she was serious), and …..here’s my favorite, to minister to women because only a woman knows how to really minister to other women. It was never about preaching Christ. 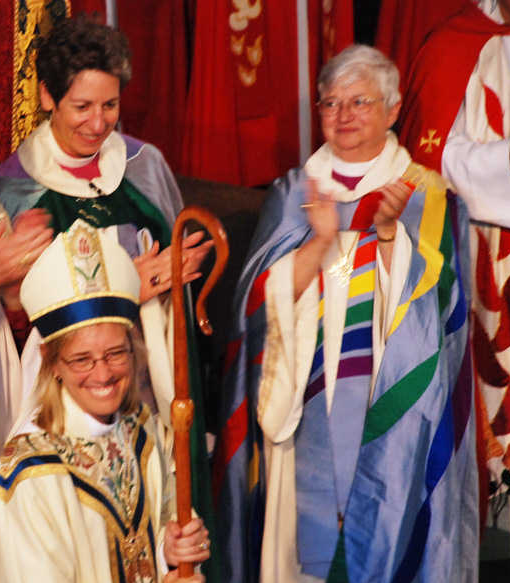 Very well said – the influx of women priests is what drove me out of the Episcopal Church. I was in high school at the time – like all madness, though, there was no stopping the women ordainers… Bishop Burt of Ohio was my bishop and was indifferent to the concerns I wrote to him and spoke to him about. He was at Church one time and in a one-to-one conversation with me was dismissive as if I didn’t know what I was talking about. One a church becomes feminized, it invariably becomes homosexualized, and then it collapses. What constitutes “feminization”? Most priests I grew up with were good, charitable men, and they were balanced personalities: strong but compassionate and understanding. When people complain about “feminization”, I’m wondering if they’d prefer a priesthood filled with UFC fighter-type personalities. In terms of churches “collapsing”, church attendance is declining across the board for both conservative and liberal denominations. Truth isn’t a popularity contest, anyhow. Islam is gaining popularity because folks in many regions seem to need its austerity and rigid orthodoxy. It doesn’t make any of it true, though. Christianity has been existing for more than 2,000 years. The Christian Church has not had women priests throughout its history, except for a few Protestant denominations. But we must keep in mind that Protestantism did not come into being until 1517 when the Reformation began. At the same time, allowing women to be priests has resulted in the loss of tens of thousands of Anglican (Episcopal in America) worshipers. In fact, allowing women to be priests in the Anglican Church is so contrary to true Christian doctrine — and consequently has disappointed so many Anglicans — that Pope Benedict XVI eased the process by which Anglicans can convert to Catholicism in 2009. On the other hand, the Eastern Orthodox and Roman Catholic Churches — which divided Christianity into these two divisions during the Great Schism of 1054 — still do not allow women to be priests to this very day. Moreover, based on the above all-inclusive article, it appears that the Orthodox and Catholic Christian Churches will NEVER allow women to be priests! Is the women’s ordination movement in the Orthodox Church collapsing? I think it is especially in America. There are about half a dozen women or so who purport themselves to be active on this matter but that’s about it really. While these folks may have spent much time and money on their theological education there is no evidence their ideas are gaining any acceptance. They may attend WCC consultations and get to speak at the occasional offbeat ecumenical conference however they have no real influence. Their own media tools have gone silent. It looks like St. Nina quarterly is not publishing much of anything in recent years and the Orthodox Women’s network appears to be dormant with no activity since 2006. There may be a squeaky wheel or two out there but the number of women who are activists in the cause of women’s ordination for the Orthodox Church in the USA can just fill your average mini-van. These folks remind me of hanging out with your crazy aunt at your family re-union. They just talk and talk but in the end the vast majority of Orthodox Americans have politely tuned out and are moving on. The movement that never was continues as the same level– if you look hard for it you will find it. Those who want to be female clergy have all got much better funded and organized churches to do that than our ethnic enclaves. Much like those who want to pay distant authority figures…. Andrew, I believe, hope and pray that you are right about the women’s ordination movement collapsing. Several years ago, a friend and I attended a women’s conference at the Antiochian Village in Pennsylvania. I went to this conference to see how strong this movement was and my friend went with me to make sure that I didn’t get into any trouble. Sure enough, the main speaker gave her speech sitting on a chair, denoucing all “-ism’s” (except feminism) and twirling an oak leaf. ( For those of you who do not know much about paganism/wiccanism, the oak leaf is very significant.) She kept the priest waiting for 45 minutes while she droned on…. and then I heard my “favorite” reason given for why women should be ordained to the diaconate (see my earlier posting). At that point I wanted to run, but I still needed to attend the session on women’s ordination to the diaconate. It was a different woman who gave this speech and after 30 minutes of nonsensical edu-babble, she finally made this statement; “until the church has women Deacons behind the altar, we will not have the fullness of the Faith”. After my friend restrained me, I turned to look at the two Priest who were sitting two rows behind me. I made gestures asking them if they were going to respond to this heretical statement, but they ignored me. Later that night this woman was given Holy Communion. My friend and I left the conference, shook the dust from our shoes and prayed, “Lord have mercy”. Stuff like this, especially statements like “until the church has women Deacons behind the altar, we will not have the fullness of the Faith” have to be challenged as soon as they are made. It is mindless nonsense of course, but you can’t let it stand. Only a man can be ordained as a deacon, priest or bishop because Jesus chose only men to be His disciples and apostles. God made that choice and obedience to God a great virtue. Feminism rejects any qualitative distinction between man and woman. Militant feminism condemns the traditional Christian faith as ‘male-dominated’ and demands equality between man and women when it comes to clerical functions. Those ignorant of the Tradition regarding female clergy are pleading for women deacons, based on the fact that the early Church had such. They ignore the fact the function of a women deacon was never the same as that of a male deacon. Women deacons were employed at female baptisms and in carying for sick women and orphans. They never served in the Liturgy. The Orthodox Church venerates many women saints but, from what I know, none of them asked for clerical functions. From my personal experience I can tell you one thing. When you find yourself amidst such talk again. Challenge them. I find when you challenge these folks calmly and rationally they fold fairly quickly especially if challenged by a well informed woman. Scratch the surface of the women’s ordination activists in the Orthodox Church and 99% of the time you will find they also hold many other beliefs that are outside the boundaries of Orthodox Christian Tradition. I think part of the reason for their movement slowly collapsing is that many of the more reasonable women who used to attend these conferences and such found out how extremist these women activists are. Andrew, one cannot hold to women’s ordination and to any traditional Christianity. Women’s ordination always devolves into some form of paganism and from priesthood to shamanism. Women’s ordination is antithetical in every way to the salvific work of Jesus Christ in the earth. The only reason I’ve ever heard as a reason for women’s ordination is to give women the power/authority/position they rightly deserve (thus the no more bringing a dish for the pot luck). The reason is clothed in a lot of other things but fundamentally, they want the power to do what they want to do. I was an Episcopalian, then “Anglican” (we avoided the “e” word) in two of the “continuing Anglican” jurisdictions, both Anglo-Catholic. In the end, I decided that such a small group (regardless of their catholicity in other areas) which endorsed the branch theory left a lot to be desired when compared with the self-understanding of the Church from the first millenium. I still respect them though (i.e., the high-church Continuing Anglicans). I have read Ms. Lindsey’s articles on Virtue Online. It is nice to see someone come out of Episcopalianism for reasons that aren’t so shallow as, “I don’t like women priests.” or “I don’t like gays.” It’s not about liking, it’s about Tradition. Once I considered Roman Catholicism. The first parish I visited was fairly modernist in its sensibilities. I was talking with a nun in her office. No habit, street clothes. She told me of the baptism that was going to happen in a week or two. A gay couple was coming to have “their child”, (actually the biological child of one of them) baptized. I’m glad the little fellow got baptized, but . . .
We started talking about her attitudes toward this or that traditional teaching and modern innovation. At some point, having heard more than I ever wanted to know, I asked her, “Wouldn’t you be more happy in the Episcopal Church?”. She laughed and replied that she was going to stick around and work for change from within. Has anyone noticed that, at least in the Catholic Church, most of the womens’ ordination advocates are old geezers and bitties? Seriously…the blue haired birkenstock set. Well, guess what? They are slowly but surely dying off. There are now new women’s religious orders that are habit wearing, very traditional, and NOT into ordination for women. Honestly, concerning the Orthodox churches…I’ve only met maybe four women who advocated priesthood for their gender and…they were openly mocked by other Orthodox women. They came of age in the 1960’s and 70’s and never grew up. 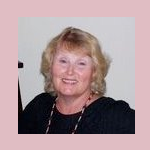 Alice, thank you for your interesting post, and for your work generally. Yours is a powerful witness against the error of our age. I’m wondering, though: Is it all about the blood? What do you make of the headship of the man? You seem to accept that manhood and womanhood make no difference for any other role in society or the Church, just the role of priest. That’s a barely less feminist position than the Episcopalian extreme. As a biblical anthropologist, I am concerned with understanding the cultural context of the biblical material, especially at the oldest, pre-Abrahamic layers. The matter of blood and blood guilt was a universal concern of primitive societies, and we can safely assume that this is the basis for the emergence of the office of priest/mediator by whom the blood of an animal was shed as an act of atonement. However, there is more involved here. Among primitive peoples, there must be an accounting for all shed blood and this stands behind the Levitical concerns about the woman’s monthly flow. The oldest layers of the biblical material reveal a binary worldview when it comes to blood, circumcision and gender. This is not a popular idea with feminists and this binary framework of the Bible undercuts their rationale and insistence that men should not be allowed their natural superior status in creation. You can imagine that I am not very popular with feminists. The evisceration of the binary worldview of the Bible renders as meaningless the kenotic event of Jesus Christ. I assure you this view is far from the Episcopal Church’s politically correct stance on gender. And yes – “Huh? You gotta be kidding.” – is the usual response even from people who say that they believe the Bible. Alice, have you studied life expectancy data across the ages? I remember reading about Mormon history in the USA, migrations west and so on. Then it happened I had to drive across the country several times in each direction through pretty much the same patch of countryside. You head west from the lush plains, the ground gets higher and drier, forage gets harder and harder, seasons more extreme. You get to western Wyoming and its the high plains, passable but not easy living when transport is hard. Then it’s eastern Utah and the Wasach pass, full of water, trees, and its a green oasis coming down to the west. Then… it’s the great Salt lake and plain, hundreds of miles of mud flats with next to nothing and then eastern Nevada where it’s dry scrub. You can about imagine… a revelation. “We’re stopping here!! This is it!! A sign from on high!” Well it was also good sense. About the same feeling heading east from Egypt into Israel. Departing folk from the west look a bit further and.. “We’re stopping here!! This is it!! A sign from on high”. Well it was also good sense. So look at the environment surrounding these theological verities. What do you see? Women dying in childbirth all over, they didn’t even have a common word for great-grandparent. People lost children and went to monasteries to retire and die within a few years because they had no other visible support and banded together. Anthropologically it is very very plain that to be clergy you had to be educated to some degree. At least be able to read, follow directions, basic mobility, vision. Now in those days that already put you way, way ahead of 90% of everyone. Educating women was not a serious anthropological from a energy return standpoint. Women died, took care of the youth in ways the men couldn’t. Books were rare. Female clergy wasn’t anything anyone had time for. Today? Nearly everyone in a parish is as literate as the priest, and many are more highly educated. Women live longer than men and are equally educated. Women can function everyday of the month with over the counter safe medications. The “Aha, here is were we must plant our flag” — driven by the means folk have of existing where they find themselves changes as the means for existing in the world has changed a great deal. So the challenge is to understand is the all male clergy the result of merely theologizing a demographic reality, or is there a transcendent requirement there? If there is a transcendent requirement there, somehow I doubt it would have its essential basis in the mundane of somatic plumbing cycles. P.S. I am not part of any lobby ‘for female clergy’. I do point out if we want to survive the reasons for what we do can’t be based in essential part on the physical limitations those living 2,000 years ago found themselves not in evidence today. Anyone with two eyes will note that it is not presently 100 AD, and if doing as we do depend on living as they did then we are a museum, not a church. Alice, I’ve read several of your posts and find them also very interesting, but I still wonder how far beyond the priesthood you would carry the binary of male and female. Does it not also support the headship of the man generally? It would appear to do so. Speaking of binaries, I named and defined the binary relationship between the Father and the Son, as well as between the man and the woman, in my recent article entitled “The Problem with Hierarchy: Ordered Relations in God and Man” (St. Vladimir’s Theological Quarterly, 54, 2, 2010). You will find in my article some independent confirmation of your view. In the article, I also contrasted that natural relationship with the economical relationship we commonly recognize as hierarchical. In brief, a hierarchy is an order based on dissimilarity of nature, inequality of powers, subordination of wills, and mediation between persons. In contrast, an archy is an order based on similarity of nature, equality of powers, unity of will, and immediacy of persons — on account of the derivative relationship of the persons, one person being the source, the arche, of the other person. The Trinity is an archy because the Father, Son, and Holy Spirit share the same nature, are all equal, are of one will, and relate directly with each other without mediation, on account of the Father being the Arche of the Son and of the Holy Spirit. Likewise, the man and the woman are naturally an archy, the woman being made from the man, of the same flesh and bone, originally equal and united in will, relating directly to each other and to God (not one through the other to God). This remains the way the man and the woman are supposed to relate, the way they should strive to relate, and the way they will relate in the next life. The fall, however, requires special measures to keep the man and the woman together, so God decrees a hierarchy, subjecting the woman to the man for the sake of unity, to bind together what has been torn apart until the sinews of love heal enough to hold on their own. This is the first of many subjections and also the slightest. All are necessary to keep many-willed man from contention and estrangement until they can learn to live together only archically. Female priests, as well as female presidents, are inconsistent with both the natural archy and the economical hierarchy, both of which assign headship to the man. Some people will, of course, say, “You gotta be kidding.” But the patristic argument against female priests was always based on the headship of the man, and my experience is that when you raise children in that tradition, they have no trouble accepting it because it is so plain in scripture and tradition. One of the gifts to me at baptism, is that I experience grace wherever it is present, and where it is not- I have a great sense of its absence. Having said that, when I was recently at the funeral, each time the female priest would bless us, using the same motion of fingers, that a male priest uses, the grace in the whole room would disappear. EVERY single time, the grace would just disappear, and not only that, a sense of darkness that was prevailing and disturbing would take the place of God’s grace. It was most distressing, and in a time when we especially needed comfort, since it was at a funeral. When our male (Orthodox) priest blesses us, the room is FLOODED with grace. So not only are these unfortunate women hurting the faith, but they are hurting the church, the people, and causing great spiritual harm. It is an abomination.